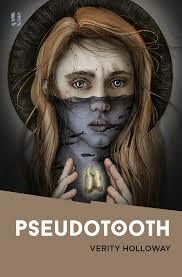 In the tale of Pseudotooth we find Aisling Selkirk,a young girl stuck in that strange period of our lives where we all endure the transition from adolescence to adulthood. It's something we've all been through, being deeply unsure of what it is we're supposed to do with our lives and just what is laying in wait around the corner. But Aisling is what you would call - extremely farsighted - and can see beyond the sphere that everyone sees. As a result she suffers mental trauma which presents itself in the physical manifestations of strange blackouts and seizures which no doctor can explain. Events spiral quickly in the house, first there are unwanted visitors and then Aisling stumbles across an ancient Tudor priest hole down in the cellar which sends her world upside down. She meets a dashing young man named Chase who takes her away from everything she knows and hates. At first the story feels very cramped and claustrophobic giving you an insight into Aisling's unique perspective. As I read the first part I felt it was taking too long to get going, but with hindsight I see that it was necessary so that we could feel and see what Aisling feels. It is a great adventure story and very unique to anything I have ever read. I hate it when you can easily predict what's going to happen next in a story but there is none of that in Pseudotooth. This is a tale about outcasts and misfits, each character is an outcast either through choice or destiny. There's not one character in here you could call normal which makes for a captivating tale. Even Beverly the mother goes through strange rituals such as relentless dieting in order to fit in and Aunt Edythe is a woman trapped i within her own strict rules. Pseudotooth reminds me of the saying, "We're mad in our own little ways," and examines the fight and struggles people will put themselves through to feel accepted within society. I have to admit this is a very strange book, but I really enjoyed it. I would describe this as being speculative fiction that errs on the side of literary fiction. I'm not embarrassed to admit that I usually don't go in for high brow literary fiction. For me it's all about delving into a great story that grips you instantly taking you off on a great adventure, but this book did just that as well as exploring many themes such as loneliness, acceptance, revenge and finding peace. There is a very strong dreamlike style of writing which really adds depth to the tale. I really liked this book and would definitely recommend it to others. This is a brilliant debut and I'd love to see more books from Verity Holloway. Verity Holloway was born in Gibraltar 1986 and grew up following her Navy family around the world. She graduated from Cambridge's Anglia Ruskin University with a First Class BA IN Literature and Creative Writing and went on to earn a Distinction Masters in Literature. Her short stories and poems have been widely published with her story, 'Creating Imelda' being nominated for the Pushcart Prize. In 2012 she published her first chapbook, Contraindications. Her novella, Beauty Secrets of the Martyrs, was released in 2015. Her first non-fiction book, The Mighty Healer: Thomas Holloway's Patent Medicine Empire (Pen and Sword), a biography of her Victorian cousin who made his fortune with questionable remedies, was published in 2016.